Hydrant Flushing - Associated Technical Services, Ltd. Annual hydrant and pipe flushing programs will improve water quality at the tap, exercise fire hydrants, and uncover potential problems. 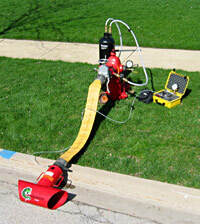 Hydrant flushing plays an important role in the operation and maintenance of a water distribution system. Water quality can deteriorate during delivery from the treatment plant to the consumer due to a number of factors. Most water utilities have their distribution system pipes flushed on a planned maintenance schedule. Pipe flushing is done to improve water quality at the tap, increase the efficiency of the system, and help to uncover potential problems with valves, and hydrants. Crews open up fire hydrants and allow water to flow through water mains at a rapid rate. Flushing stirs up and removes sediments from the mains along with poor quality water from the system, replacing it with fresher water from the source. Each hydrant is run for a period of time while crews perform the necessary tests. Directional flushing or unidirectional flushing is used to describe the operation of the valves during flushing to maximize velocity and control flow direction. Flushing is usually accomplished by opening one or more hydrants in a planned pattern. Hydrants should be operated to pull the freshest water into the area being flushed. Flushing programs usually start at the source and move out through the system. Ensuring that the hydrant valves are working properly. Improved water quality by removing accumulated sediment from the system. Helps to maintain effective chlorine disinfection levels. Improves water quality by eliminating taste and odor problems. Increased water safety by controlling bacterial growth. Verifying safe pressure levels for Fire Protection. 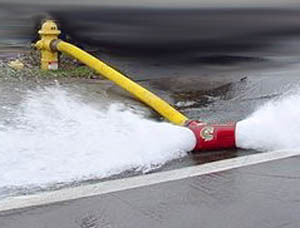 Usually a Hydrant Flushing program is conducted during the late evening and early morning hours to minimize the inconvenience on the water user. Overall, the benefits of a hydrant flushing and testing program far out weigh the temporary inconvenience associated with the program.